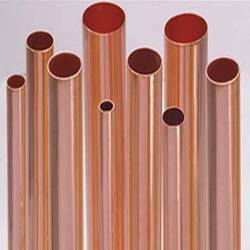 PVC Coated Copper Pipes, For Drinking Water , Size: 2"-3"
Trychem Metal And Alloys pressurized ACR/Med copper tubing is available in 10, 12, and 20 ft. lengths, and a variety of sizes, both Type L and Type K.
Specifications Types: Round Pipes, Copper Coils, Di-Oxidized Non arsenic (DONA), DOW Copper, Pure Copper. - Hardness: hard, half hard, quarter hard and soft annealed. Our Company is one of the remarkable organizations for offering a wide array of Copper Pipe tothe customer. For the benefits of our clients, these products are fully tested by the quality detectors to ensure demanded quality. Moreover, we are offering these products at industry leading price. Golden Copper Steel Pipes, Size: > 4"
Size: 1"-2", > 4", 3"-4", 2"-3", 0-1"